Balancing Butterflies – Science is Fun! Spring has sprung and while the caterpillars are out munching on my garden, getting energy for that big change coming in the summer, we can make our own butterflies! You will need: cardstock or heavy construction paper (regular paper is too floppy), tape, 4 pennies, a toothpick and markers or crayons for decorating. 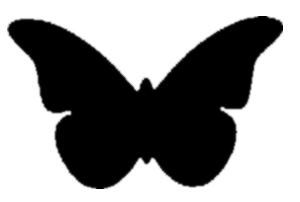 Cut out a butterfly shape like this one – or any other shape where the wings are much higher than the head. Decorate your butterfly however you like. Tape 2 pennies on the very top of each wing. Tape a toothpick to the middle of the butterfly so one end poke out where it’s head should be. Place the end of the toothpick on your finger. Does the butterfly balance? Bounce your finger up and down gently to see the wings flap! You work the same way! As long as your center of gravity (near your belly button) stays over (or under) whatever is holding you up, you won’t fall down either! Try moving the coins or cutting out a different shape. Does the butterfly still balance?